I told you some weeks ago that we will have a great bluegrass event here in Östringen-Odenheim (about 15 miles away from the R'nG-Club). Meanwhile there's also another great event going on here. On 15 April the American singer David Lee Howard) will be at the Linsabauch-Bar in Odenheim (Untere Klosterstraße 6, 76684 Östr.-Odenheim). This little bar is directly in the center of our town - 50 meters away from our city hall. This event will start at about 8.30 p.m.
On 29 April our '3. 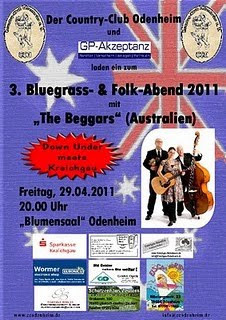 Bluegrass- und Folk-Abend' will take place at the Blumensaal in Odenheim (Eppinger Straße 23; about 150 meters away from the Linsabauch). This building is at the corner of the streets to Tiefenbach and Neuenbürg. Our guests will be the Beggars from Australia. I think we will begin at about 8.00 p.m.